Peter Cho and his son, Elliott, at H Mart. IMAGE: Thomas Teal. 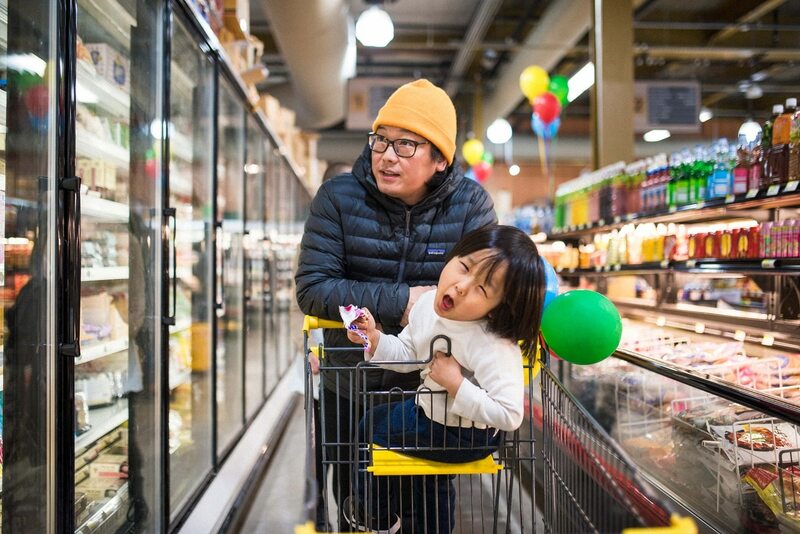 When H Mart, the famed Korean supermarket chain, finally opened on Southeast Belmont Street last week, after a year of delays, the city rejoiced. 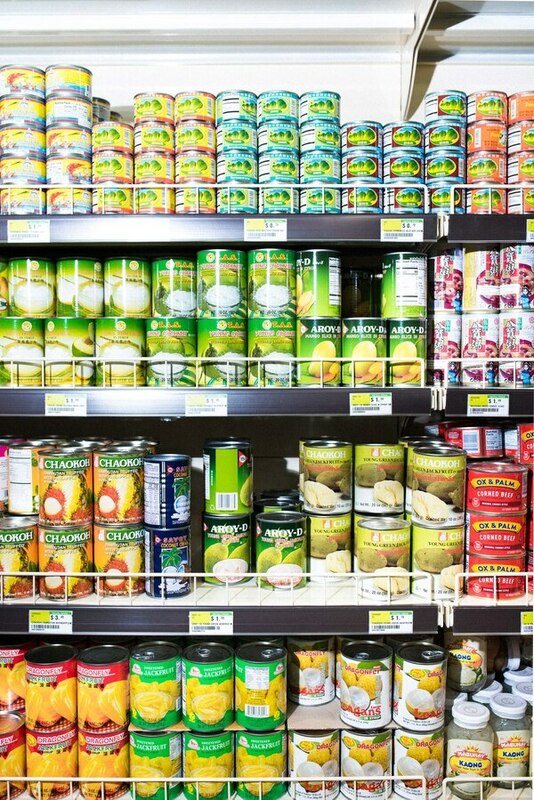 At long last, Portlanders with an affinity for Korean cuisine no longer had to trek to 82nd or Beaverton to stock up on tteok, dashima and bulk kimchi. 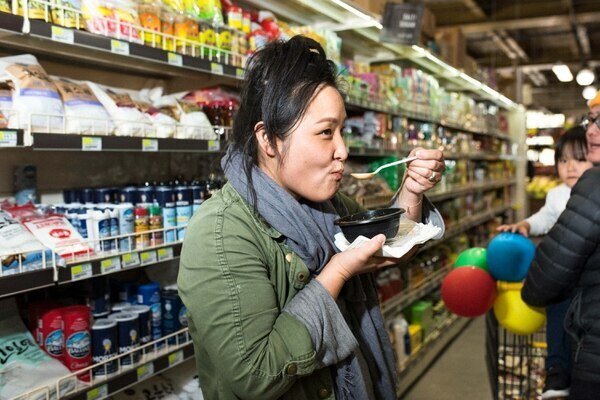 Related: Portland's H Mart Has Finally Announced an Opening Date. But Portland's most esteemed Korean chef is a bit more conflicted. "Most of the wholesale ingredients that we source they don't really have here," says Peter Cho, chef and owner of the nationally renowned restaurant Han Oak. "We needed perilla and they don't have it. We need butane, which is a funny thing, but you find it at Asian markets because a lot of Koreans like to have a little butane burner that you just plug in, like a little table-top one." Two days after the long-awaited opening of the new location, Cho shopped at H Mart with his mom, his 4-year-old son, Elliott, and his wife, Han Oak co-owner Sun Young Park, to pick up some food for a family-style meal with Han Oak's employees before the restaurant began service for the day. "A lot of my guys haven't had a lot of Korean food, which I don't expect them to," he says. "But this is good for them to see." 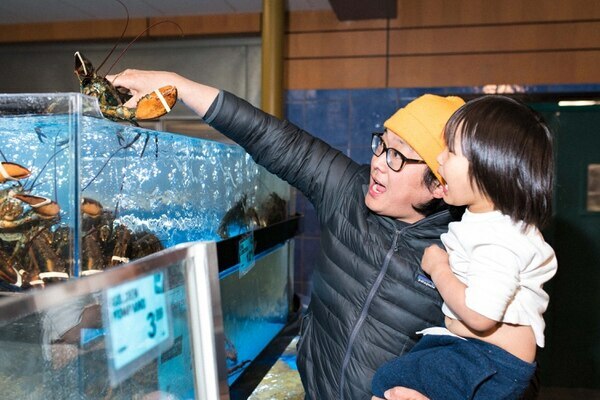 Though the Portland H Mart's pared-down inventory doesn't make it an ideal place for an upscale restaurant to source ingredients, Cho has no desire to quash the hype around the store's opening. "People are stoked on it," he says, "and that makes me so happy that people care this much." "We lived in a time when people weren't stoked on Korean food," Park adds. "I would take my American friends to go get Korean food, and they would literally spit their food out. I grew up feeling like what I was eating was shameful, off-putting, stinky. Growing up in Los Angeles, in one of the largest populations of Koreans outside of Korea, it was hard to move to Portland and not have the accessibility of Korean food and ingredients. 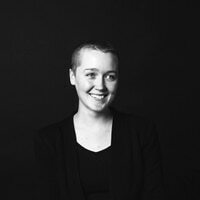 The fact that this is here, I feel like a little bit of home has come to me." To get a sense of how professional chefs might use H-Mart, we joined Park and Cho on their inaugural shopping trip. Here's what ended up in their cart. The only ingredient Cho bought for his restaurant were sweet, green shishito peppers from the produce section. "These are the best," he says. "It will probably just be sliced and sautéed or something before it goes into a dish." As they walked around the store, Cho and Park munched on a bag of Nongshim Cuttlefish Snack, which looks like polygonal, pink and yellow Rice Chex, and is meant to taste like grilled cuttlefish. "We're on the honor system here," says Cho. "It's not like we're going to eat the whole thing before we get to the register." H Mart also sells Japanese snacks, including the popular, chocolate-covered Pocky, but Park picked up a pack of Pepero, the Korean equivalent, from an end aisle. Somewhere between Pocky and a Pirouette, Park describes the wafer tube as a "chocolate-filled biscuit stick." 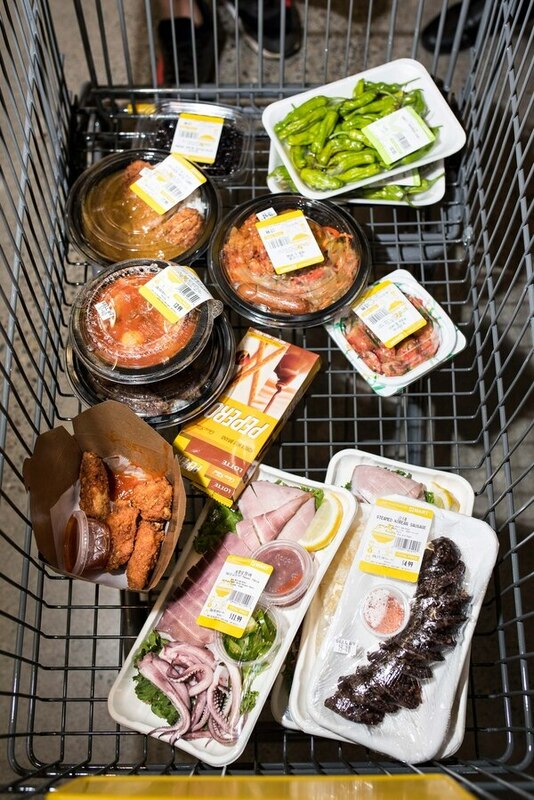 In the grab-and-go section, Cho picked up several types of jeotgal, a blanket term for briny, seafood side dishes. That included a pink, gelatinous item labeled at H Mart as "small salted clam," which according to Cho tastes a little salty, a little spicy and very fishy. "A lot of this stuff is scary," says Cho. "This is like raw clams in a spicy sauce, marinating." Cho also grabbed some salmon poke and salted pollock roe, or cod egg sacks, to bring back to Han Oak. Though Cho didn't buy any doenjang at H Mart, he says the paste should be a staple in anyone's Korean pantry starter kit. "You should have gochujang, which is fermented chili paste," he says. "You should have doenjang, which is soybean paste. It's like the Korean version of miso but a little funkier. Gochugaru is the Korean chili flake, but really you can get any chili flake [and] sesame oil. Just with that, it's a good start." Across from the salted clam in the grab-and-go section, Cho picked up a pack of ready-for-the-grill bulgogi, thin cuts of beef in a soy sauce marinade that's quintessential Korean barbecue. "I feel like, for the home cook who doesn't cook Korean food that often or is scared to put in the work and slice meat and marinate and stuff, this is the game changer," he says. "I haven't [bought pre-marinated and -cut bulgogi], but I wouldn't turn my nose up at it at all. I'm all about, especially on our days off, just cooking easy. I really try not cook on our days off, but this kind of stuff is fun, it's easy." 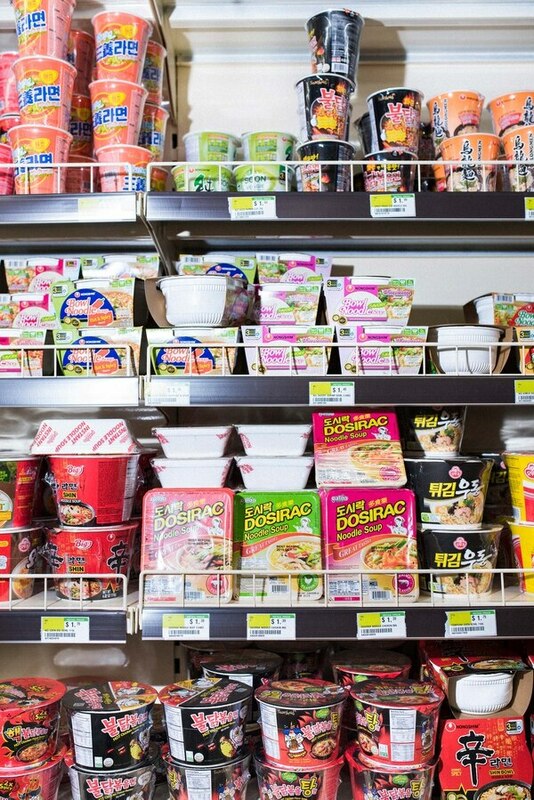 SHOP: H Mart, 3301 SE Belmont St., 971-407-3167, hmartnw.com. 11 am-8 pm daily.